There are definitely both pros and cons to seeing a band at the very beginning of a long and gruelling tour. Pros: there’s likely next to no fatigue and the band is full of energy. Cons: many un-ironed kinks are apparent and need to be worked out before a groove is found. 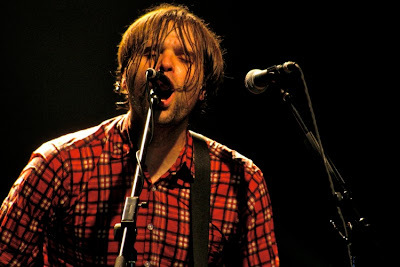 Both were clearly evident in Death Cab For Cutie’s gig on Wednesday night as they kicked off a series of small club warm-up shows to promote the forthcoming album Codes and Keys before hitting up amphitheatres and theatres this summer. Having graduated from “indie darlings” to commercial success thanks to breakout albums Transatlanticism and Plans, seeing a band in a small setting that has progressed to larger venue status is always a special treat. With that being said, tickets for Wednesday’s show were snatched up quicker than one could say Zooey Deschanel. The foursome hit the stage wasting no time kicking off the evening with a hits laden set starting with the raucous bass driven stalker single, “I Will Possess Your Heart”, followed by familiar favourites “The New Year”, and 2001’s The Photo Album’s “Why You’d Want To Live Here”. It wasn’t until five songs deep before we received a sampling of what’s to come from the forthcoming Codes and Keys, the dude bashing yet melody filled track, “Some Boys”. With a scattered set list mostly concentrating on the last three albums, it was more than enough to please the faithful that came to hear vintage Death Cab, even if there were quite a few noticeable blips and hiccups along with a subpar soundboard mix. Regardless, no love lost – it was an opening night free pass. Although some songs sounded tighter than others, evening highlights included the Narrow Stairs single “Cath”, the new and instantly catchy “Underneath The Sycamore” which is easily a forthcoming single, and the Ben Gibbard solo performed, “I Will Follow You Into The Dark”. It was until the very end of the night that we received the massive crescendo building anthem, “Transatlanticism”, a track so huge you’d have to not have a pulse to not feel the electric vibe unison sing along of Come on! It was about as feel-good as it gets. With a capacity of roughly 1,100, needless to say many were shut-out of the Phoenix on Wednesday night for a are up close and intimate setting. But before disappointment has enough time to set in, Death Cab will be back in just two short months on July 29 at the much larger Molson Canadian Amphitheatre. Surely by then they’ll be a well oiled machine in the fine live form they’re normally known for. I am a music geek with a constant ear to the ground. If I hear something interesting or see a show that's worth mentioning, you just may read about it here. Got something I should hear? Drop me an email. "Every generation has a biological right to believe that the music of their youth is the greatest music of all time." "It really is amazing how a song can take you to a place, a time, from the past and make you feel the way you did back then...no matter how you feel at the present time... maybe that only happens to me...but I doubt it."